U.S. Sen. Bob Menendez acknowledges supporters while arriving to an event kicking off his campaign for re-election at Union City High School, Wednesday, March 28, 2018, in Union City, N.J.
Sen. Bob Menendez may have escaped federal prosecution on bribery charges, but his colleagues issued a rare public rebuke Thursday and declared his actions had "reflected discredit upon the Senate." The criticism was lodged in a letter from the Senate Ethics Committee that "severely admonished" Menendez for accepting numerous gifts from a donor without prior approval and then failing to report them. The committee also said Menendez had inappropriately used his position as a senator to advance the personal and financial interests of the donor, Salomon Melgen, a Florida eye doctor. The committee ordered Menendez, a New Jersey Democrat up for reelection in November, to repay fair market value for all gifts it deemed impermissible. It wasn't immediately clear how much Menendez might owe. He previously repaid $58,500 for flights on Melgen's private jet. "You demonstrated disregard for [ethics] standards by placing your Senate office in Dr. Melgen's service at the same time you repeatedly accepted gifts of significant value from him," the letter says. "Your assistance to Dr. Melgen under these circumstances demonstrated poor judgment, and it risked undermining the public's confidence in the Senate." The Ethics Committee opened its investigation in late 2012 but had put it on hold while his criminal case was ongoing. The rebuke it issued Thursday was "basically the highest level of sanction the committee could impose," Robert L. Walker, former chief counsel and staff director of the Senate and House ethics committees, said in an interview. Menendez' lawyer, Marc Elias, released a statement late Thursday that didn't take a position on the committee action but said: "We are glad that this Ethics Committee process that began nearly six years ago is finally resolved." The two-paragraph statement said Menendez had "acknowledged and made substantial payments" for Melgen's gifts more than five years ago, but that he had halted making remedial action, including amending his financial disclosure forms to reflect them, at the request of the committee staff. With the committee's process concluded, the statement said, "Sen. Menendez looks forward to continuing to serve the people of New Jersey." Menendez's bribery trial ended in a hung jury in November. A federal judge later acquitted the senator of some of the charges, and prosecutors subsequently dropped the case against the senator and Melgen. In a separate case, Melgen was convicted of Medicare fraud and sentenced to 17 years in prison. 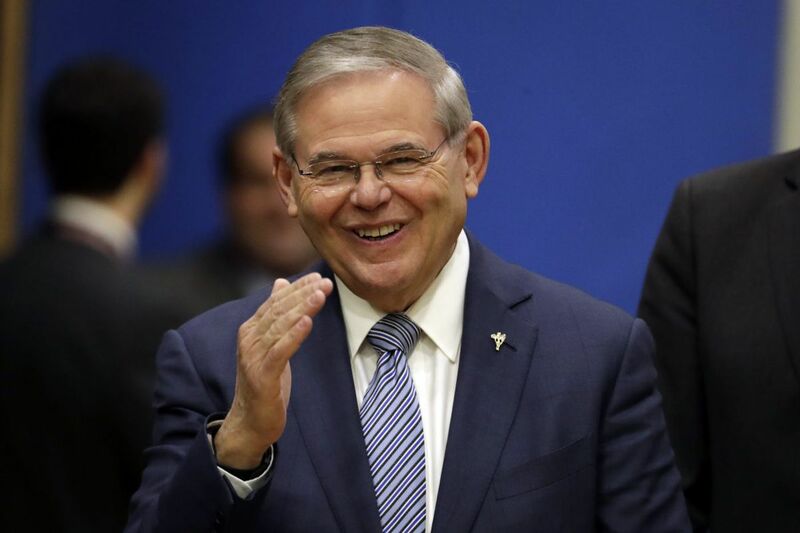 Menendez had been accused of accepting trips on Melgen's private jet, hundreds of thousands of dollars in campaign contributions, a $1,500-per-night hotel room in Paris, and vacation stays at Melgen's villa in the Dominican Republic. In exchange, prosecutors said, Menendez helped obtain visas for Melgen's foreign girlfriends, pressured government officials to resolve his $8.9 million billing dispute with Medicare, and sought to protect Melgen's port security contract with the Dominican Republic. At trial, Menendez's lawyers said Menendez's actions were motivated by his longtime friendship with Melgen and legitimate policy beliefs. The last New Jersey senator to face such public reprimand from the Ethics Committee was Robert Torricelli, a Democrat who ended his 2002 reelection bid shortly after being admonished. For his part, Menendez has the full support of the party establishment in what is expected to be an expensive Senate campaign against Republican Bob Hugin, a former pharmaceutical executive.